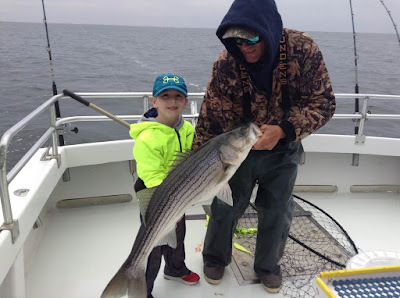 Ryley with his 36" Striped Bass in April 2015 aboard the Wound Tight. With Spring upon us most hunters are preparing for the upcoming turkey season. In the Chesapeake Bay, and all along the East Coast, anglers however are gearing up for the opening of the striped bass season. If you’ve never experienced the bite of a striped bass on the end of your line you should give it a try! Popular options range from pier and surf fishing to charter boat fishing. You can troll for ‘em, cast to ‘em or live line ‘em. In Maryland the trophy striped bass season generally opens up in April and runs through May and allows anglers to catch one fish. Typical charter boat costs average about $125 to $150 per person. Most people, after catching a striped bass, typically just filet the fish and discard the rest. If you are one of these people, STOP DOING THAT! You are throwing the best parts away! There is so much you are missing out on. If you are lucky, and smart, you could end up with a lot more than just your fish as well. (More on this later!) The next time you catch a striped bass try doing some of the ideas below to help extend the life of your fish and expand your culinary knowledge base. Striped Bass ready to clean. Some of you might be familiar with pork cheeks, aka hog jowls. Well guess what, fish have these too and they are just as tasty. The cheeks are located on the head right below the eyes, as can be seen in the highlighted yellow area above. The process is pretty straight forward and only requires a sharp filet knife. You will notice a rather large “scale” between the cheek and the gills. Insert the filet knife up under the scale and work in a circular fashion to loosen up the cheek meat from the head. Then simply remove the flesh by cutting it out and then remove the skin. These can be prepared a multitude of ways from grilling to sautéing. You can’t go wrong with sprinkling some J.O. No. 1 seafood seasoning on the cheeks and sautéing then in a little butter, just like a scallop. You’ve never heard of J.O. Spice? Well if you’ve lived in Maryland your entire life and eaten blue crabs chances are you probably have tried it, you just didn’t know it. Most restaurants is J.O. Spices instead of the other nationally known brand. If you find yourself with several cheeks, experiment with different seasonings to find what you prefer, J.O. offers quite a few varieties. For more information on J.O. Spice head on over to their website at www.jospices.com. No, these do not call for starch, and yes they are worth the work. As with the cheeks the collars are another overlooked portion of fish. These take a little more effort but result in more meat. The “collar” is the area of the fish directly behind the gills back to where one would typically filet the fish. This can be seen in the area above, highlighted in blue. The trick to removing the collars from the head is to have a pair of wire cutters and a sharp filer knife. First you need to take the wire cutters and clip the narrow point where the gills come together under the head. Next remove all gills from the fish. Where the gills meet the top of the head, carefully beginning to cut away the flesh until you are only left with bone. Then use the wire cutters to sever the bone until your collar resembles the picture below. One of the most important things to do, or actually NOT do, is DO NOT SCALE THE FISH. Keep the scales in the fish as this helps protect the skin and meat underneath when you cook it. 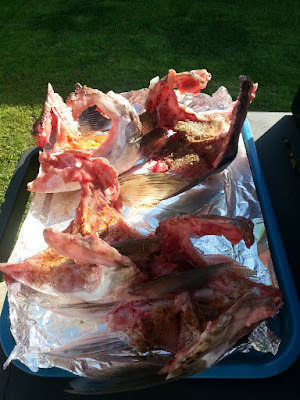 If the collars are large enough they can be split in half, however the best results are when the collars can be cooked standing up so that the fat located in the belly can help self baste the fish. Simply sprinkle some of the J.O. No. 1 seafood seasoning and some kosher or rock salt on the collars and grill them on high heat until they resemble the picture below. The cooking times will vary depending on the size of the collar. The best meat can be located attached to the pectoral fins and along the belly. For additional recipes and insight in to collars and cheeks check out the links below.